I'm dedicated to cooking. For me it has always been a life saver. The evening meal is my special time. GARDEN SHEDS, AND WHAT IS BEHIND THE DOOR?? What do you keep in your Garden Shed? What type of Tools do you use? Do you make your own? What recycled materials do you use? Dare I say it What Chemicals and Fertilizers Do you use, Do you use Cert Organic Products or Do you make your own? What does you shed look like, please show us a photo if possible, it would be fun to see different Sheds. I decided it was time for a clean up. I don't like clutter and I have been feeling like my garden has been highjacked by a pumpkin vine and madagascar beans. So Garden got a haircut. 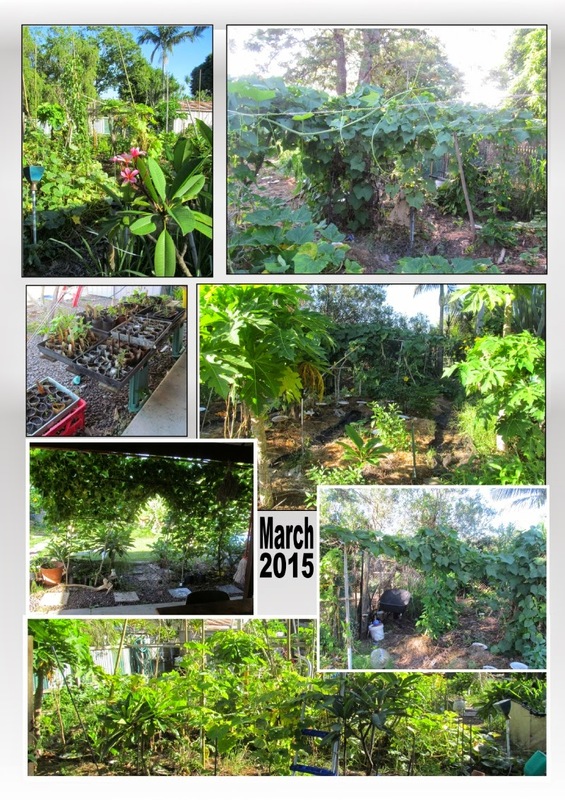 The Garden in March, 2015. Hopefully the Summer heat and humidity is in the past and seedlings get a better start in life. Despite the wet Summer, the garden looks bedraggled and unsure of itself.It hasn't quite decided which plant will rule the soil or the air.